Petaluma Health Care District (PHCD) is proud to announce that it has been honored as California’s Healthcare District of the Year by the Association of California Healthcare Districts (ACHD). PHCD Board President Elece Hempel, Treasurer Josephine Thornton and CEO Ramona Faith attended ACHD’s 63rd annual conference in Monterey where they were presented with the award at a special dinner and ceremony on May 7. The award, given to just one out of 78 districts, seeks to recognize a District that has implemented programs and/or services that have yielded direct and measurable benefits on the health and well-being of its residents. For more than 65 years serving Southern Sonoma County, PHCD has worked to develop and support health and wellness services, programs and initiatives that uniquely benefit its residents. 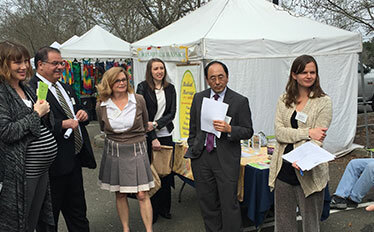 In particular, through the Healthcare District of the Year award, ACHD touted PHCD’s model of convening unconventional partners across all sectors to take action and improve local health issues, and highlighted two of PHCD’s community initiatives, Community Health Initiative of the Petaluma Area (CHIPA) and HeartSafe Community (HSC). CHIPA is an Advisory Committee of PHCD’s Board of Directors that seeks to identify root-level health issues and takes action to engage in policy, system and environmental change to improve local health. HSC is an initiative led by PHCD to strengthen the community’s response to cardiac emergencies through CPR/AED training, strategic AED installation, maintenance and registration, and heart health education.